Back cover blurb: YOU HAVE SIX SECONDS TO READ THIS MESSAGE… The body of a 15-year-old is found hours after she sends a desperate message to her friends. It looks like suicide, until a second girl disappears. This time, the message is sent directly to the Metropolitan Police – and an officer’s younger sister is missing. DS Nasreen Cudmore and journalist Freddie Venton will stop at nothing to find her. But whoever’s behind the notes is playing a deadly game of hide and seek – and the clock is ticking. YOU HAVE 24 HOURS TO SAVE THE GIRL’S LIFE. MAKE THEM COUNT. 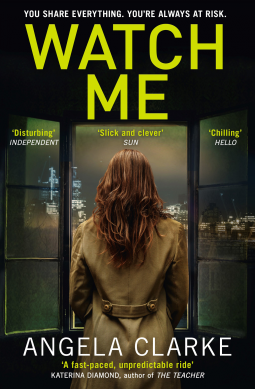 Watch Me is another nail biting thriller in the Social Media series from Angela Clarke.This time the focus is on Snapchat rather than Twitter, and is equally as terrifying at identifying just how dangerous online usage of social media can be. When the body of a 15 year old girl is found, along with a suicide message posted on Snapchat, the Met Police are sure it's just another teen suicide. But when another teen is reported missing (having posted a near identical snap chat message) with connections to someone in the Met, the tables are suddenly turned. 'YOU HAVE 24 HOURS TO SAVE THE GIRL’S LIFE. MAKE THEM COUNT'. DS Nasreen Cudmore knows that there is only one person she can call upon to help the investigation. A civilian and her life long friend, Freddie Venton who has an almost encyclopedic knowledge of social media. Freddie is at first reluctant to join forces with the Met again, she is still shaken from the last time, when they were hunting a serial killer via Twitter - dubbed the hashtag murderer. At this point its's probably worth me mentioning that if you haven't read Follow Me, I wouldn't worry, as Watch Me can be read as a stand alone. However, it comes highly recommended and I do think that we get to see different sides of both Nas and Freddie in this novel. But Freddie, being Freddie cannot resist the pull of helping out her childhood friend Nas, and bringing another sick criminal to justice. Watch Me is an addictive novel that I raced through to find the killer's identity. I had absolutely no idea who it was going to be, I just enjoyed the pace of the story, as it came to its natural conclusion. I can't wait for book 3! Watch Me is available now from Amazon online and all good book shops.